Guest Bio: With a background in Healthcare and sales and over 15 years in various management roles, Graham Howard strongly supports the view that for organisations to prosper, they MUST have the right people. Working in the Healthcare sector has re-enforced his belief that because this market is so specialised it needs a team of specialised recruiters to work within this area to source quality candidates. Graham’s areas of interest and specialisation include Strategic Management, Staff Recruitment and Retention, Building Profitable Relationships and Organisational Behaviour. Along with a vast array of internal and external training courses Graham has completed over the years, he also has an Associate Diploma of Business which was done part-time over 4 years and in 2004 completed his MBA. None of which he stresses, makes him a better recruiter, but it does provide him with a greater understanding of the complexities of business and how having the right people can provide companies with a competitive advantage. 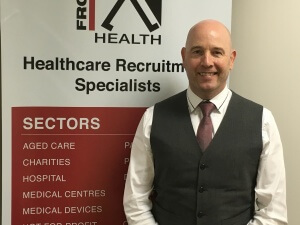 Segment overview: Frontline Health is a network of specialist recruiters for the Health industry across Australia and New Zealand. 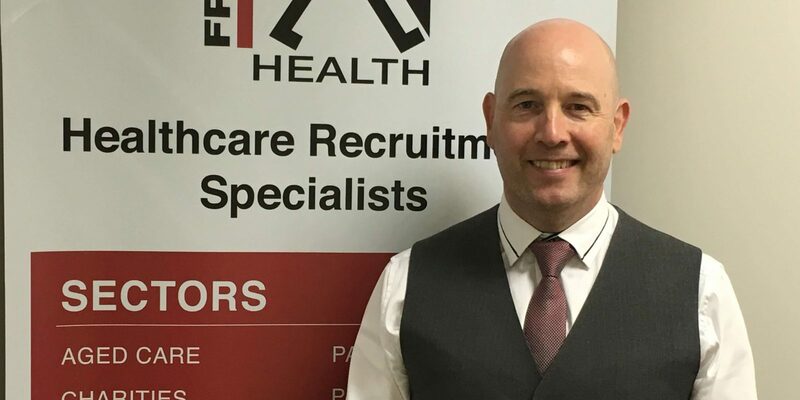 Graham Howard is the Agency Owner for Frontline Health in Brisbane and as a former candidate and client of Frontline Recruitment Group, he is acutely aware that the role of a good recruiter is to work closely with candidates and clients alike to achieve the best outcome for all parties. In previous management roles, Graham has attempted to instil into teams that being the best is not about being the biggest but about providing quality outcomes for the customer. That philosophy holds true at Frontline Health where they aim to be the best in terms of speed, quality of delivery and post placement service. They currently have five local offices in Australia, located in Brisbane, Canberra, Sydney, Melbourne and Perth, and one office in Auckland, New Zealand. Wayne Bucklar: You’re listening to Health Professional Radio. My name is Wayne Bucklar and today my guest is Graham Howard. Graham’s both the Agency Manager and the Agency Owner of Frontline Health and he’s talking to us from Brisbane. Graham, welcome to Health Professional Radio. Graham Howard: Thank you Wayne. Nice to be invited on. W: Now Graham, Frontline Health is not a business title that immediately tells me what it is you do. Can you fill us in on what it is Frontline Health does and can you give us an idea of where you do it? G: Alright, sure. Thanks for the opportunity. Frontline Health provides specialist recruitment services and we do this across all sectors of the health industry. As you would know that we are aware the health industry is a huge umbrella and we do manage to work across the majority of sectors within that. So, we work across industries such as the hospitals, it be in aged care, medical centers, also the pharmaceutical and medical device companies and everything in between. I guess our clients range from multi-site aged care organizations like hospitals to a global multi-national corporations and keeping in mind within that, the positions that we do recruit for, they are many and varied and I guess range from all operational and administrative levels but we also look to recruit in the Senior Executive positions as well. W: Alright, so you get right across the spectrum? G: Absolutely, yes. It’s a big boost that help portfolio. You were asking, I think Wayne about where we do it? G: We’ve got agencies in Brisbane, Melbourne, Sydney, Perth, Canberra and New Zealand. So the great thing about our organization is we’re able to offer that national coverage but with local expertise and local owner operators on the ground in each state and territory and in New Zealand. When I say “ours” it’s not a huge team but there’s about 16 specialist consultants in our team and the good thing about it, the proud thing we’re about this team we process more than 25,000 job applications each year. We interview more than 2,200 candidates and last year, in 2015, we were really pleased to place over a 300 healthcare professionals in a brand new role. W: That’s surprisingly large numbers. It is, as you say, a very big sector. Graham, is there a message that you’d like clinicians to take home today as a, I usually tell people we get about 95% of our audience are clinicians of some kind or another. What’s the message for them? G: Yeah. That’s a really good question for us. So, I guess it’s important, Wayne to clarify that as recruiters, we actually work with a lot of people across the businesses we help, from clinicians, operations people, clinical managers, senior management and of course because we are in recruitment, we also deal with those internal recruitment and HR teams as well. But because we specialize in permanent recruitment, we take on the entire recruitment process from end to end. So any of the clinicians and even management they’re looking to employ people, we’re saving those people time and money and more importantly allowing the clinicians of the world to focus on what their core businesses which isn’t recruitment per se. So when we work on an assignment, we try to take it much off their hands as possible so we advertise the physicians, we would process their applications, we do the screening, we interview candidates and as many as possible we would interview them face to face, again going back to that national coverage that we have. We organize the interviews with the employers, we do reference checking, we negotiate the job offer and a whole lot more in between. One of the things, Wayne, that we are particularly passionate about it that once we place someone into a role, we then follow up with both parties after a period of time to see how that person is settled in. Because when people go into a new role, it’s great to think it’s going to be ABC, not so good if it turns out to be XYZ. Check, basically both parties on a regular basis just to see how that fit is going. Yeah, recruitment … particularly to your question about clinicians, but if I can lump in the recruitment on HR teams and those as well Wayne. What we at Frontline Health are trying to do is build long term relationships with those clients and also the candidates. So we want to be provide quality and consistency in what we do and, I guess provide the client with exceptional candidate and provide that candidate with great new careers so working in different fields. W: If you just joined us today on Health Professional Radio, my name is Wayne Bucklar and I’m in conversation with Graham Howard. Graham is the Agency Owner and Manager of Frontline Health in Brisbane and we’ve been talking about the recruitment work that, primarily what recruitment group do and we’ve been talking about the recruitment work that Frontline Health do and we’re just about to move on to my favorite question. Graham in every industry, in every endeavor there are always misconceptions. What’s the misconception amongst your costumers, clients, recruits, clinicians – what’s the misconception that drive you nuts and keep you awake at night? G: What I’d love to say that there are no misconceptions about what we’re doing. It’s always interesting because when you are on this side of the fence you always think it’s very clear what we do, but undoubtedly there are misconceptions. So it’s actually a good question and a great opportunity, I guess to try and alleviate some of those and I guess I’ll look at it from two perspectives, one is from the candidate perspective and one from the client’s perspective, the clinicians. If I can talk about the candidate perspective first of all, there are a couple of things, misconceptions from their part. Firstly the belief from them that we could place every person that comes to us. There are only a certain number of positions, there’s lots of candidates. So unfortunately though it is, we’re always gonna be saying no to more people than we are gonna be saying yes they’ve got a role. But everyone that comes to us thinks that they’re gonna get a role and within a week. And that’s the second part of the candidate misconception, I guess the belief that the client is working to the time frame, but they aren’t. So when a client is slowly back to us, doesn’t communicate… then the candidate can and absolutely does get frustrated with the whole process. And again if I can just touch on Wayne, when clients are slow to work with a recruitment agency, not just… it doesn’t sit well on the brand either because the candidate is at the end of this is very eager to know something. So we always say in our business, yes it’s good, now is good, not knowing these the worst scenario for everyone concerned. So the client perspective, Wayne know that our biggest frustration in clients and the misconception is that they see all recruitment companies are seeing with little differentiation between them which is simply not the case and there is much, much more to recruitment than sending across a CV. More than 65% of our placements last year in Frontline Health, were a job different from the one that the candidate actually originally applied to. The higher caliber candidate in a new role is just not reflecting what the work involves and trying to achieve that outcome, so what I’m saying to that 65%, they can into our system applying for a different role but we placed them in role somewhere else because we identify the skills set, built relationships with our clients, understood what they were looking for. So we’re not just looking for that quick one of placement, we’re looking always to build strategic relationships with health care businesses, trying to give best choice to candidates and best candidates to our clients. W: Well Graham, with a little bit of luck today we can help to dispel or at least ameliorate some of those misconceptions that you’ve talked about. Is there a way for people to get in touch with you, Graham? G: Yeah, a couple of options. First of all, there’s our website so www.frontlinehealth.com.au. Also alternatively I’m happy to take emails from anyone that wants to email directly, that’s ghoward all lower case ghoward@frontlinehealth.com.au. W: Now if you’ve just joined us and you’ve missed my conversation with Graham, the good news is there’s also a transcript on our website and on SoundCloud and YouTube we have an audio archive where you can hear the full interview again. So that’s of Health Professional Radio website at www.hpr.fm. Graham Howard, Agency Owner and Manager at Frontline health in Brisbane, thank you for your time today. It’s been a pleasure having you on the air with us. G: Likewise and I appreciate the opportunity, Wayne. Good talking to you. W: It’s been out pleasure. You’re listening to Health Professional Radio, thank you for joining us today.